"THE DEVIL AND FATHER AMORTH"
In 1973, William Friedkin directed The Exorcist, a movie that scared the hell out of audiences and became the all-time definitive horror movie centered around demonic possession. In 2016, he became the first person ever allowed to record an actual exorcism. You'll see it in his new documentary The Devil and Father Amorth. Friedkin's remarkable footage will be the selling point, but the film goes beyond it, raising provocative issues that will have you thinking and discussing long after it's over. The first twenty minutes are set-up, with Friedkin talking about how he met Father Gabriele Amorth, one of the Vatican's leading exorcists. We also hear how he received permission to film the exorcism and how his famous movie stoked his interest in the subject. Then we get to see the exorcism itself, which is the ninth Amorth has performed on an Italian woman named Cristina. This lasts about 15 minutes. Finally, the director interviews neurologists, psychiatrists, and clergy to get their perspectives on the footage he shot, as well as to see whether they have any input into what may have caused Christina's actions. The exorcism is mesmerizing – and very different than what you see in The Exorcist. There's no spewing of green puke, levitation, or spinning around of heads. Still, something happens to this woman. She thrashes about violently, needing several people to hold her down. Her voice, though, is the most chilling element. It sounds...inhuman. She makes disturbing statements. This is the sort of thing that does not seem as though it could be faked. If Cristina is not possessed by a demon, she at least believes that she is. The Devil and Father Amorth works, in large part, because it was directed by Friedkin. The subject of demonic possession and exorcism provided him with the biggest triumph of his career. He is forever tied to it in the public's mind. Friedkin's focus here is more personal than anything. This is his story as much as Father Amorth's or Cristina's, and probably more so. There aren't a lot of interview segments with the priest or the subject of the exorcism. Instead, the emphasis is on what the director saw and the manner in which he attempts to wrap his head around it. In other words, it's about him grappling with the authentic version of what he famously portrayed in The Exorcist. That connection provides the documentary with extra meaning. When Friedkin interviews the experts, his questions are imbued with genuine curiosity. It's clear that he believes the possession of Cristina was real. Although he's completely open to hearing what they say, you get the sense that he's hoping they won't be able to provide some irrefutable alternate explanation. That's not to say that he's in any way cynical or biased; the director just seems legitimately fascinated by the prospect of a good priest battling evil head-on. The Devil and Father Amorth is ultimately a meditation on faith, suggesting that if the devil is real, God must be, as well. At only 68 minutes, there was certainly room to explore the subject even more deeply. There's also an extremely important – and utterly bizarre – twist in the proceedings at the end that Friedkin wasn't able to capture on camera. He handles it as best he can without that crucial footage, yet it's still awkward without it. Not that this matters all that much. 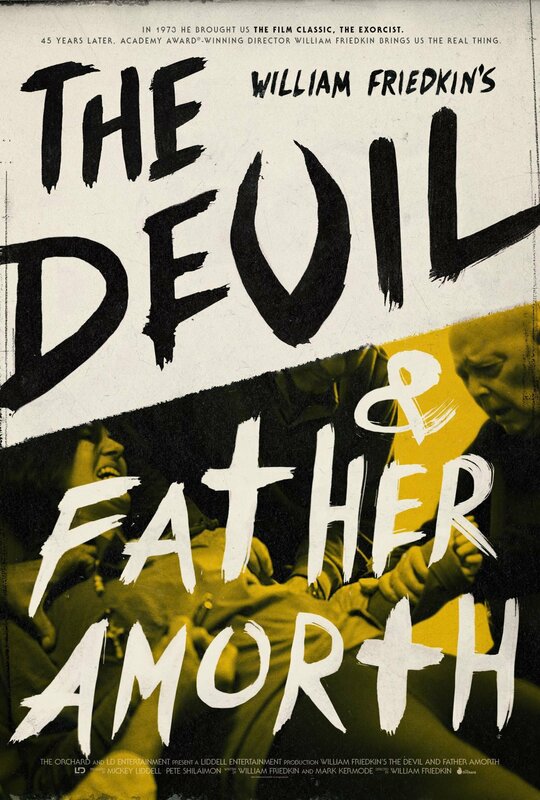 The Devil and Father Amorth captures your attention with the dramatic exorcism footage. The way Friedkin and his interview subjects ponder the possibilities of possession afterward is what gives it true resonance. Watch the documentary back-to-back with The Exorcist for maximum impact. The Devil and Father Amorth is unrated, but contains some intense imagery. The running time is 1 hour and 8 minutes.